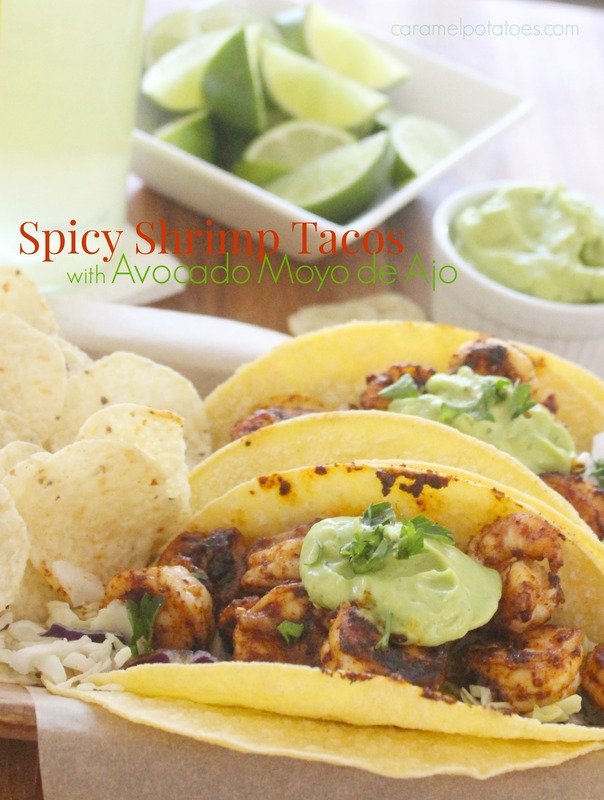 Happy Cinco de Mayo – these Spicy Shrimp Tacos are a perfect way to celebrate. Spicy Shrimp cooked with a roasted garlic olive oil makes for one delicious dish. But wait- top it off with Avocado Moyo de Ajo, a creamy avocado garlic sauce and you’ll soon be going back for seconds. The base for both the shrimp and avocado sauce is a roasted garlic oil. 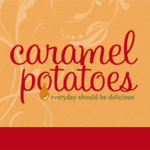 It’s easy to make and one you’ll want to keep on hand to flavor all kinds of food. 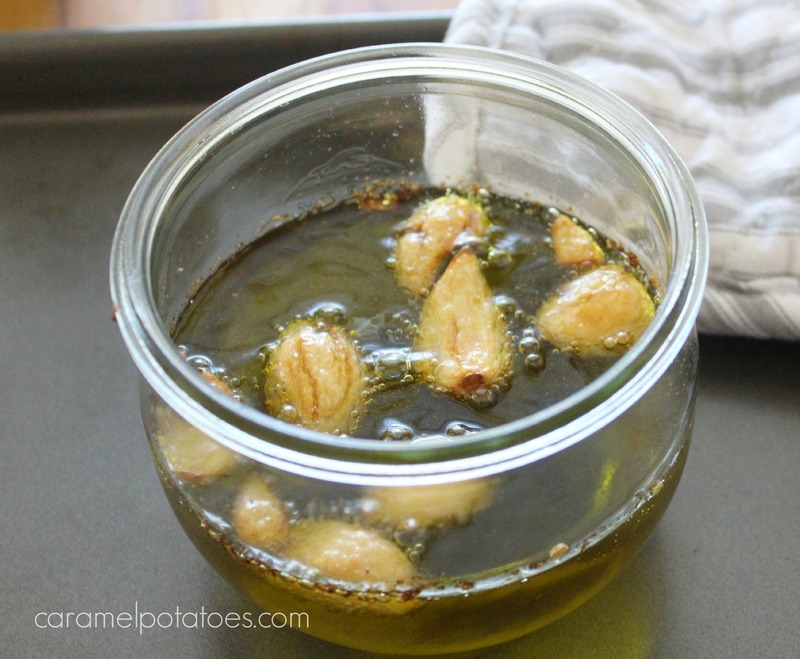 To make it you simply cover crushed garlic cloves with olive oil and roast for about 30 minutes. 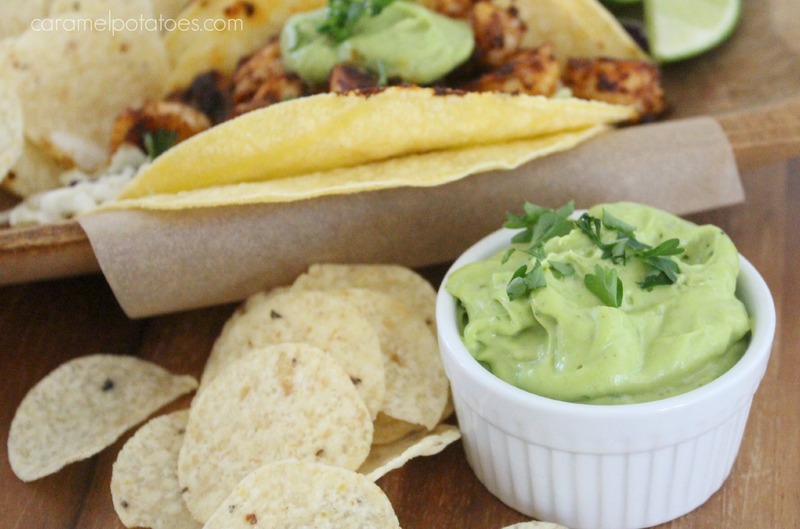 Use this amazing Garlic Oil to cook your shrimp and add it to fresh avocado to make the Avocado Moyo de Ajo – grab and bag of chips because this is really good! Put it all together and you’ve got a delicious dish that will turn any day into a celebration! To make the Garlic Oil: Preheat oven to 350 degrees F. Take a meat mallet or the flat side of a knife and smash garlic lightly. Place garlic cloves in a small oven-proof dish and cover with olive oil.Roast for 30 minutes, until garlic cloves are golden brown; cool. To make the Avocado Moyo de Ajo: Add avocado, lemon juice, cilantro, and ¼ cup of the garlic oil (strained) to a blender. If you like a more pronounced garlic flavor, add a clove or two of the roasted garlic. Blend until smooth and creamy. To Make the Shrimp: Pat shrimp dry to remove any excess moisture. In a larger skillet, heat 3 tablespoons of the garlic oil. Working in 2 batches, saute the shrimp in garlic oil for 1-2 two minutes on each side, sprinkle shrimp with chili powder and stir until coated. Transfer to a plate and serve. 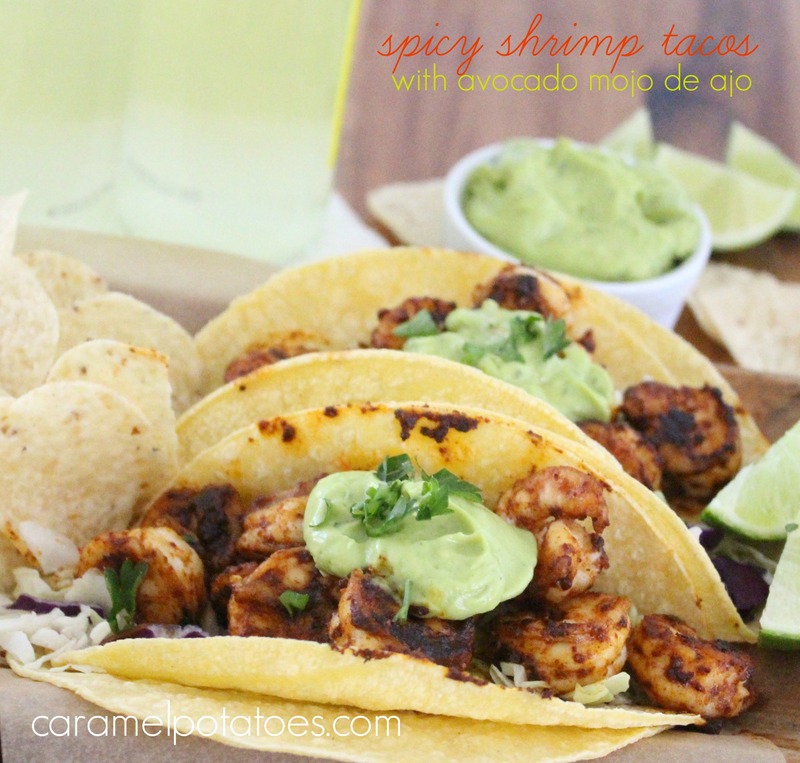 For each taco, add cooked shrimp, avocado mojo de ajo, and top with chopped cilantro, onion, and a squeeze of lime. *Note: The roasted garlic oil is a great recipe to double or triple, the oil keeps in the fridge for weeks, and you can use both the oil and the garlic in your everyday cooking.